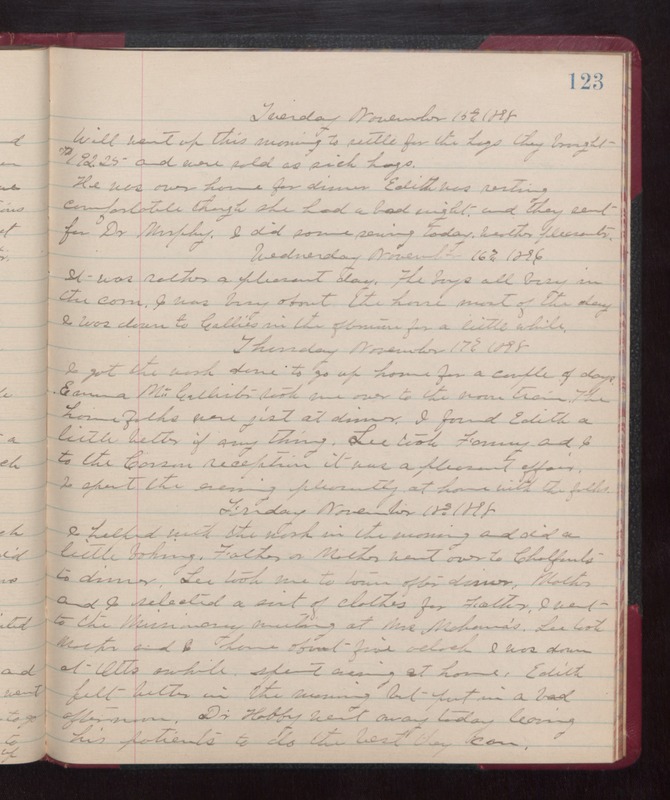 Tuesday November 15th 1898 Will went up this morning to settle for the hogs they brought $192.25. and were sold as sick hogs. he was over home for dinner. Edith was resting comfortably though she had a bad night and they sent for Dr Murphy. I did some sewing today. weather pleasanter. Wednesday November 16th 1898 It was rather a pleasant day. The boys all busy in the corn. I was busy about the house most of the day. I was down to Callies in the afternoon for a little while. Thursday November 17th 1898 I got the work done to go up home for a couple of days. Emma McCallister took me over to the noon train. The home folks were jist at dinner. I found Edith a little better if anything. Lee took Fanny and I to the Cousin reception it was a pleasant affair. I spent the evening pleasantly at home with the folks. Friday November 18th 1898 I helped with the work in the morning and did a little baking. Father & Mother went over to Chalfants to dinner. Lee took me to town after dinner. Mother and I selected a suit of clothes for Father. I went to the Missionary meeting, at Mrs Mahanna's. Lee took Mother and I home about five oclock. I was down at Otts awhile. Spent evening at home. Edith felt better in the morning but put in a bad afternoon. Dr Hobby went away today leaving his patient's to do the best they can.